*List $79.99 >> special offer: $49.99 per book for the most recent 2nd edition. *Recommended by Jim Kinsler of Kinsler Fuel Injection. *Recommended by Jim Rehfeld, fuel injection expert at Enderle Fuel Injection. *Recommended by Vernon Tomlinson, Hilborn Fuel Injection. -information about most major manufacturers of constant flow fuel injection in the US including Enderle, Hilborn, Kinsler, Ron’s, and others. -List price $79.99 per book. Currently selling for $49.99 + shipping/handling and any applicable sales tax. (c) mild & radical cams, and many other parts. However, the engine will not run well with any of these unless the fuel injection is set up properly. 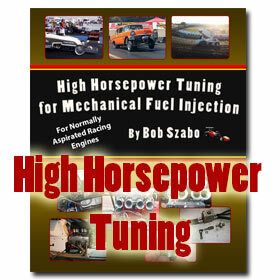 This book tells about setups used by successful race engine tuners to reach that goal. This book provides knowledge about mechanical fuel injection for more powerful and reliable performance. The drag race blown alcohol application is highlighted as an example although much of the information is applicable to other auto and boating sports. Additional information is provided for fuel injection tuning of gasoline, ethanol, and nitomethanol powered race engines as well.